Our drive from Moab, Utah crossed a section of road known for deer migrations. Signage indicated how many deer had been hit in the previous year; we passed three dead deer. As we drove onto Navajo lands, one of our first spires before the city of the same name was Mexican Hat. Our hotel, The View, listed only a post office box for an address, but as we approached Monument Valley distinctive rock formations came into view and we had no trouble making our way to the Monument Valley Navajo Tribal Park. Because it was too early to check into the hotel, we drove the 17-mile Valley Loop Drive for our introduction to this unique area. Traveling about 15 mph over the unpaved dirt road, we stopped several times for pictures of West Mitten Butte, Merrick Butte, Three Sisters, Rain God Mesa, and Artist’s Point. Every room at The View offers a private balcony; our well furnished room (#230) at the far end of the hotel was unique in that it offered a longer private balcony with views in three directions. We booked a 2½ hour sunset tour with Forth World Tours and had a private jeep tour with a guide, Elliot, who took us into the restricted area for some exclusive experiences. For example, we visited one of his grandmothers in her hogan where she demonstrated spinning yarn. It started raining as we approached the Eye of the Wind arch but I walked through the mud to take a picture of this arch poised between two branches of a dead tree. It was still raining when we arrived at the Hogan. Some other tours left the area as we took shelter under this cave like arch. Suddenly a deluge of water poured through the opening above us creating an instant waterfall. The sunset lighting created distinctive images of Totem Pole and at Artist’s Point. After the rain passed over us, it was visible in the distance. We passed by the Cube, the Thumb, the Hand & the Eagle. 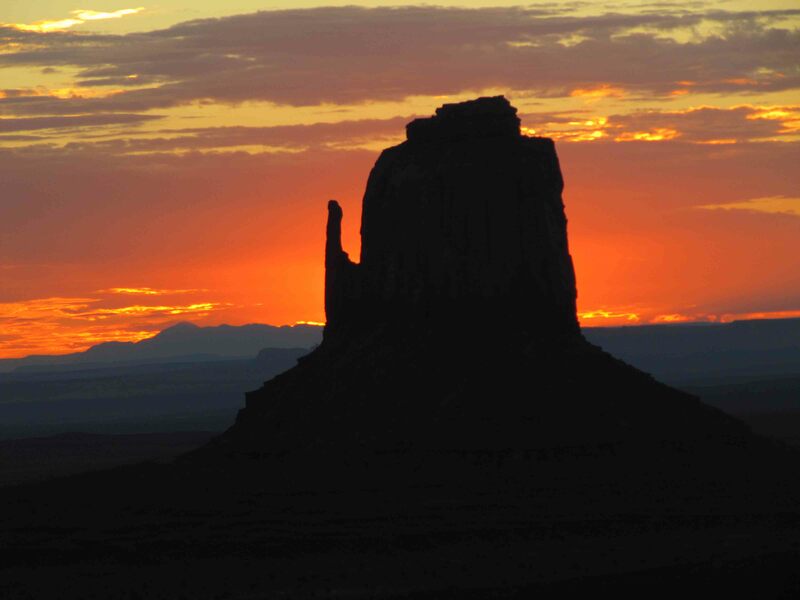 We took a short walk to the North Window for a distinctive Monument Valley sunset panorama. The sunrise views of the iconic West Mitten Butte, East Mitten Butte, and Merrick Butte were beyond description. After breakfast we hiked the 3.2 mile Wildcat Trail, the only publicly available trail in this area. The trail is fairly level as it loops around West Mitten Butte offering impressive views of the rock monoliths from the valley floor. Many movies have been shot in this region taking advantage of its unique, beautiful landscape features. 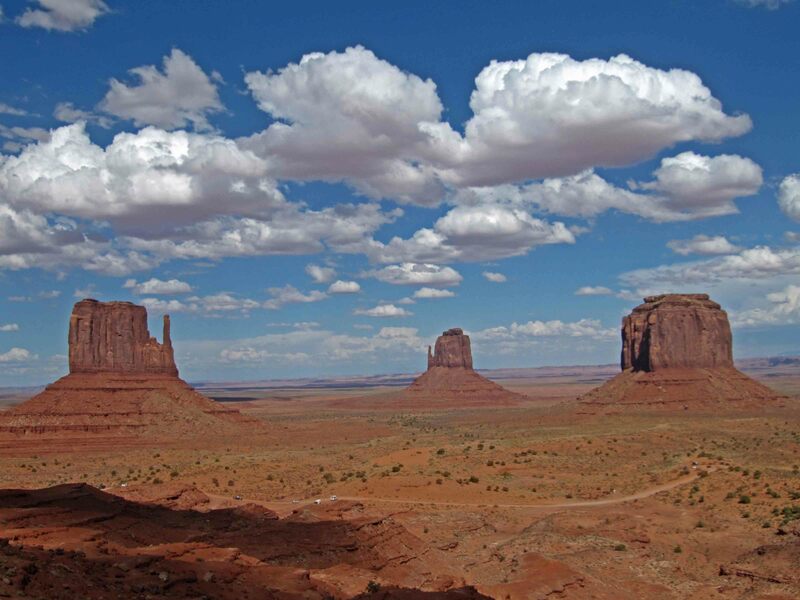 A visit to Monument Valley is a wondrous experience! Edward Abbey would describe us as “industrial tourists,” visitors limited to exploring the terrain on paved roads. Nevertheless, we spent a special day in the Arches National Park. After visiting the Visitor Center, our first stop was to examine the unique spires, the Three Gossips. In the Windows section we viewed Turret Arch, North and South Windows. The primitive loop trail was less traveled and gave us great views of the South and North Windows. We lunched in the picnic area near Balanced Rock. After lunch we hiked to the Upper Viewpoint of Delicate Arch. One of my favorite hikes was back to the Sand Dune Arch. The end of the 18-mile road is Devils Garden. We walked to both Tunnel Arch and Pine Tree Arch. It is amazing to have so many arches so close to one another. Arches National Park rocks! After leaving Capitol Reef National Park, we continued to enjoy the colorful rock formations along Highway 95, one of the least traveled roads in America if our experience is representative. In some places the rocks were gray and looked like piles of cement. 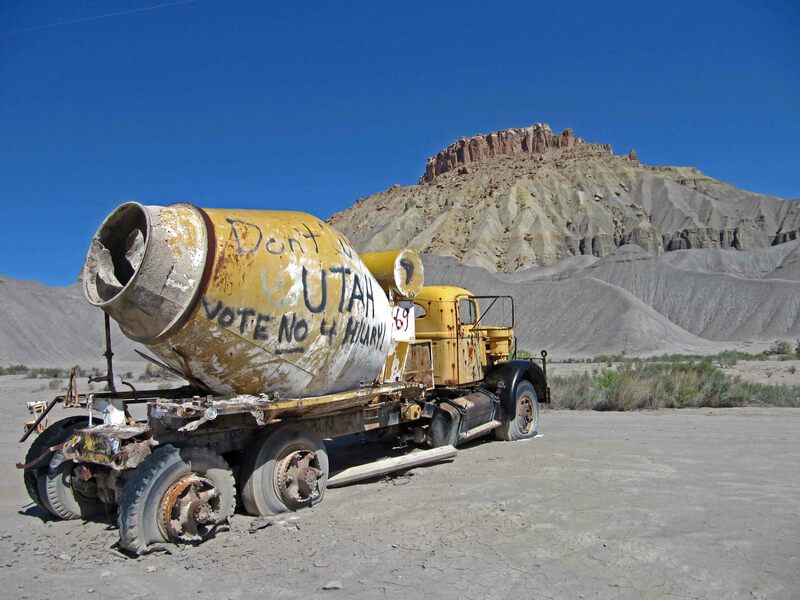 At one point we even passed an abandoned cement truck posed below a gray rock formation. An interesting cloud formation appeared above the Henry Mountains, the last named mountains in the continental United States and unusual in this area for progressing from west to east. Later the Hite Overlook gave us expansive views of Lake Powell. Near this spot the Dirty Devil flows into the Colorado. The city of Hite was a boom town during the uranium rush that followed World War II. In 1883, Case Hite wandered up the White Canyon from his mining claim on the Colorado. 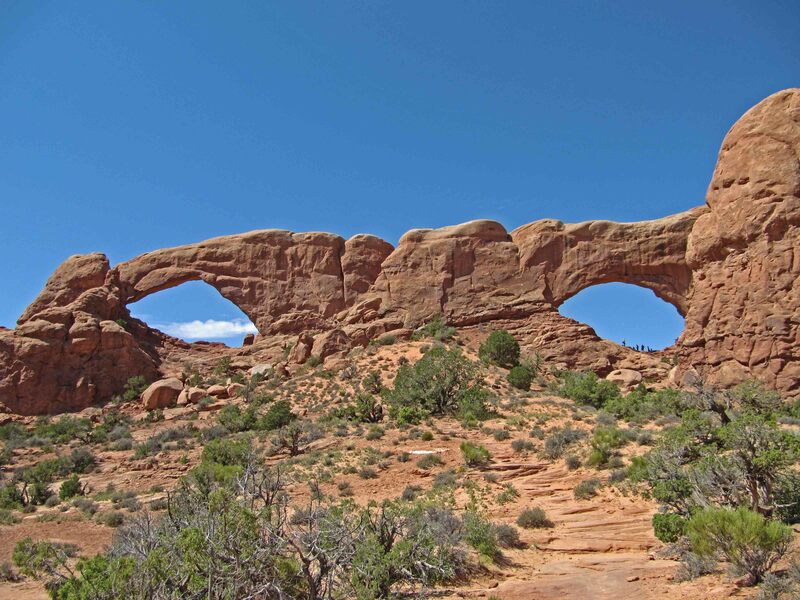 He saw the three natural bridges in close proximity that in 1908 became Utah’s first National Monument, Natural Bridges. The three bridges take their names from Hopi culture. Sipapu means “place of emergence.” Kachina was named for the Hopi spirits which frequently displayed lightning snake figures on their bodies. Similar snake patterns were found carved at the base of this bridge. Owachomo is a Hopi word for rock mound. The unpaved trail to Owachomo Bridge has sections of bare rock and uneven steps, it is the easiest of the three bridges to view from underneath, only 0.2 of a mile with a 180 foot elevation change. Natural Bridges National Monument is a special place. Utah’s All American Road, Highway 12, is an unheralded gem. We stopped at the Grand Staircase – Escalante Visitor Center in Cannonville, Utah where we learned that this community in the Bryce Valley, named after an early Mormon leader, was settled in 1876. Hummingbirds were extremely active at the garden feeders. In 1996 1.9 million acres of the Grand Staircase were set aside to preserve wide open spaces and intact ecosystems that allow for scientific opportunities. Cliff formations are colored pink, gray, white, vermillion, and chocolate. In Escalante we stopped at the modern (2005) Gold-LEED-rated Escalante Interagency Visitor Center. The Homestead Overlook, situated at 9,400 feet above sea level, provides a dramatic panorama including faraway Navajo Mountain in the Glen Canyon area. This section of Highway 12 on Boulder Mountain was not completed until 1985. 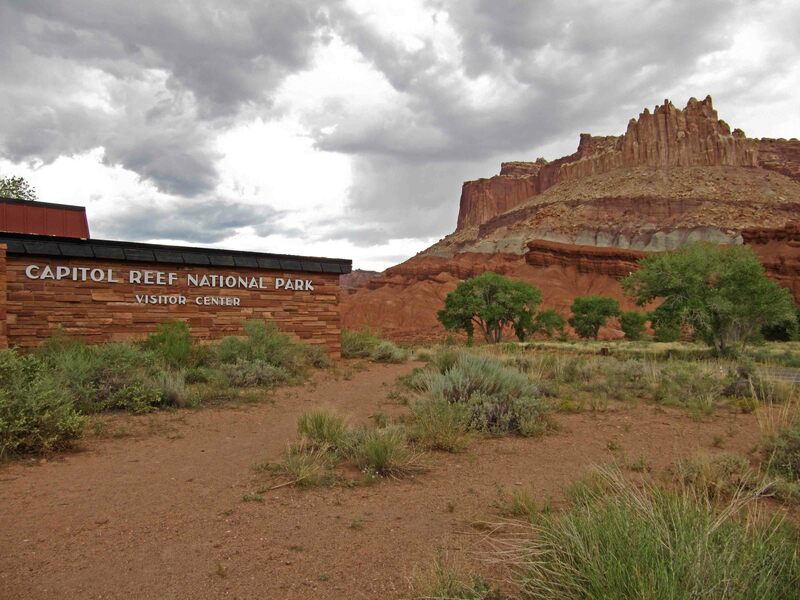 After lunch in Torrey, we visited the Capitol Reef National Park Visitor Center where we viewed a film on the importance of water in this desolate area and heard a Park Ranger explain the key feature of the park, a 100-mile long monocline known as the Waterpocket Fold. Unfortunately, the road to the Fruita area was closed due to construction. Thus, we drove along Highway 12 with a stop at the Fruita Schoolhouse, a small structure dwarfed by the surrounding cliffs but which had as many as 22 students and served as a social center. A doe and fawn peacefully grazed near the historic school. We drove to the Hendrick Bridge Trailhead along the Fremont River. This one mile hike to the Hendrick Natural Bridge rises 400 feet with views of Capitol Dome. While we dined back in Torrey with views of colorful rocks, more than a dozen hummingbirds bombarded a feeder outside the window near our table. Our motel room looked out at a ridge of color. The sunset was memorable but the morning sun heightened the view. One of the informational signs indicated that Capitol Reef has some of the best visibility in the lower 48 states, during the summer visibility averages 145 miles. Although only about two miles of the scenic Fruita road is open during road construction, we were able to visit the Gifford House where we saw artifacts from earlier days. We also purchased a small peach pie for our picnic lunch. Another stop before leaving the park featured petroglyphs, markings from what archaeologists call the Fremont people. Capitol Reef National Park is a remarkable place. 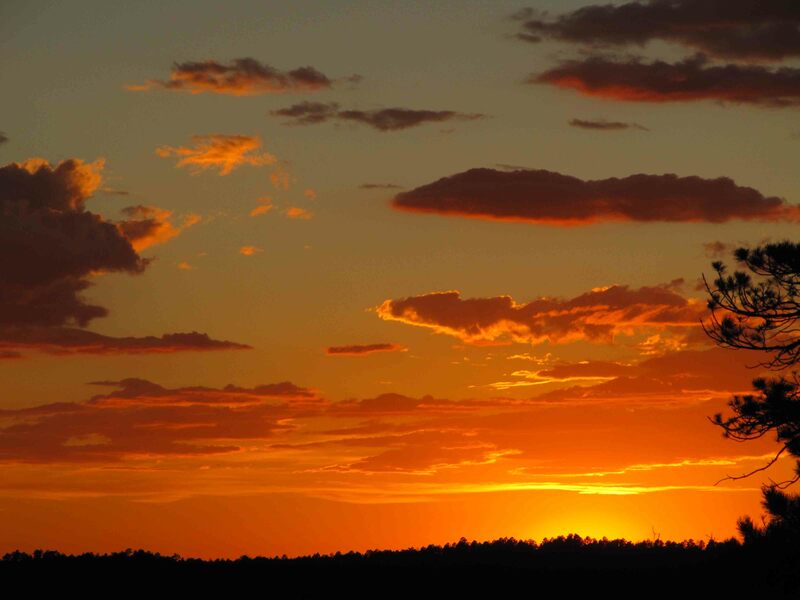 The short drive from the Grand Canyon North Rim to Bryce Canyon National Park traverses scenic western landscapes. An overlook on Highway 89 offers expansive views of distant red colored plateaus. We nursed our gas to Freedonia, Arizona where one gas station only sold regular gas which necessitated returning to another station for higher octane. In the future I would wait to stop in Kanab, Utah which has more selection and slightly lower prices. The junction with Highway 12, which we traveled first last summer, immediately immersed us in Red Canyon with its brilliant red soil contrasted with green pines. This year we made no stops until we were within Bryce Canyon National Park where we parked near Sunset Point. From there we hiked the Tower Bridge Trail, with a 950 foot descent over 1.7 miles. The destination, Tower Bridge, is a window with two posts. Later, we drove the 18-mile main road to Rainbow Point which offers an expansive panorama. At the Natural Bridge there was such high contrast between sun and shadow that I was unable to capture a decent picture of this unique arch. The sun, however, nicely exposed the slopes at the Swamp Canyon viewpoint. The grottos at Bryce Point showed up well in the late day light, too. Our final stop was near Sunset Point where we observed hikers on the Navajo Trail which we may explore on another visit. Last year we drove the main road earlier in the day. It was interesting to see the same views at a different time of day. The cliff and hoodoo colors include vanilla, pinks, shades of yellow and orange, and chocolate. Most of the visitors we encountered seemed to be from other countries, especially French and German speaking. 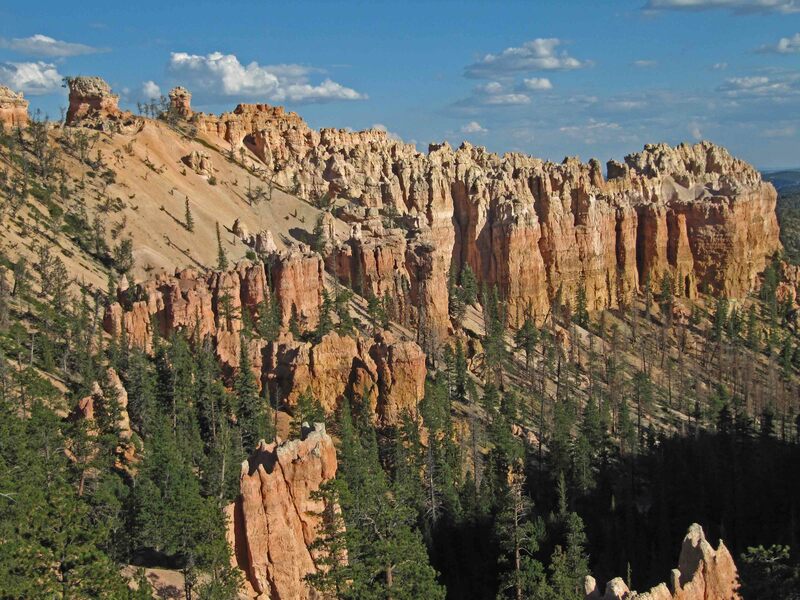 Bryce Canyon National Park is a special place to make a to do over. Our 2011 National Parks adventure started with a stop at the Navajo Bridge Interpretive Center. We walked on the first bridge which was built in 1928 and were captivated by the green Colorado River running through the bright red cliffs. After crossing the second Navajo Bridge our drive paralleled the Vermillion Cliffs National Monument. At Jacob Lake we headed south to the north entrance of the Grand Canyon North Rim. Shortly after passing the entrance station, a herd of beefalo, a cross between domestic cattle and buffalo, was grazing in a meadow near the forest. Our drive continued through the remains of a major 2006 forest fire. We successfully found a parking place at the North Rim and walked along a trail with views of Roaring Springs Canyon. We then took in the spectacular views of the Grand Canyon from the half mile round trip Bright Angel Point Trail. On our return we stopped in at the Grand Canyon North Rim Lodge which was in the midst of a fire drill. After checking in and making dinner reservations, we continued our exploration by hiking a portion of the Transept Trail which connects the Lodge with the North Rim Campground. We spotted a deer feeding in an area below our room. We attended two Park Service Ranger led programs, one on the geology of the Grand Canyon, the other on the reintroduction of California condors. Before dining in the Lodge restaurant we enjoyed the changing colors as the sun set. After dinner we returned to the deck to look through a telescope at a cluster of stars and simply to soak up the incredible number of stars that are visible to the naked eye with such a dark sky. We started our second day seeing the light hit the canyon walls shortly after sunrise. We drove to the North Kaibab Trail parking lot and followed the five mile round trip Uncle Jim Trail. We spotted another deer along this trail and saw lots of birds, frolicking chipmunks, and many different wildflowers. The view at Uncle Jim Point, 8,336 feet above sea level, was spectacular. A half-day mule trip follows this trail. In addition to hitching posts, the Point also has an environmentally friendly toilet with three sides and an open view of the Canyon. After this hike, we took a pleasant drive on a winding road to Cape Royal. We stopped for the views at Vista Encantada and Roosevelt Point. The 0.6 mile round trip paved Cape Royal Trail passes by Angels Window which has an opening with a view of the Colorado River. We lunched near a location set up for small weddings with a special view. A common raven located on the ground kept cackling with another nearby raven. Sunsets are very special! On our departure from the Grand Canyon North Rim we saw another deer, a lonely beefalo, and a flock of wild turkeys determining which side of the road was greener. 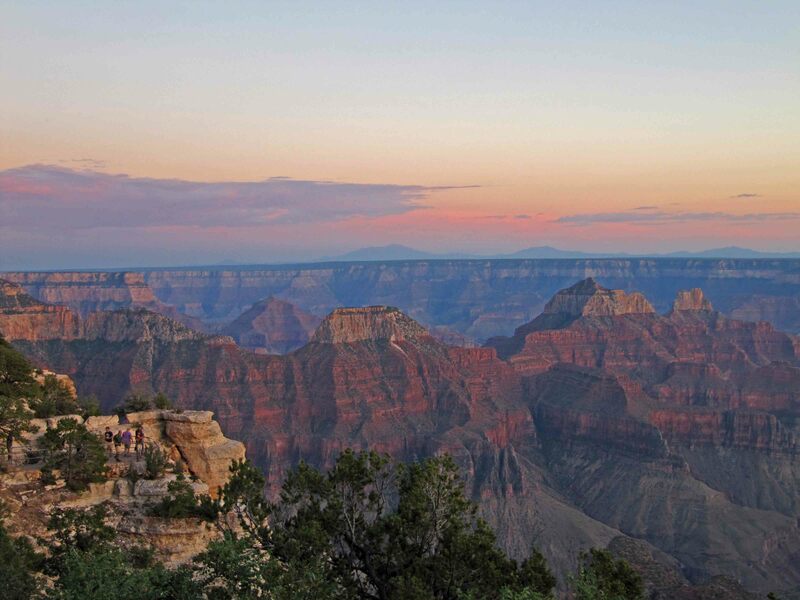 The North Rim offers spectacular views of one of the world’s wonders with fewer visitors.